The Hungarian film White God easily qualifies as one of the most disturbing films of the year. I’ll go one better: It might be one of the most disturbing films you’ll ever see, a revenge movie in which Budapest’s mixed breed dogs take vengeance on those who treat them cruelly; i.e., just about everyone in the city. Because director Kornel Mundruczo tells his story using real dogs — lots of them — it’s fair to say that White God has no precedent in film history. Uniqueness alone wouldn’t necessarily elevate White God into anyone’s upper echelon, but Mundruczo’s movie is as riveting as it is novel, a sobering look at what happens when the natural world turns on those who abuse it. It’s possible (perhaps even advisable) to view White God as an allegory, but that doesn’t mean that its vividly realistic style won’t knock you for a loop. The story begins when 13-year-old Lili (Zsofia Psotta) and her dog Hagen arrive to spend time with Lili’s father (Sandor Zoster). Lily’s mom and her current husband are off to Australia for a conference. Zoster’s character does not want to take care of both daughter and dog. Driven by frustration and anger, as well as by the trumped-up complaints of a neighbor, Dad wants the dog out of his apartment. In Budapest — at least in the movie version — owners of mixed breed dogs must pay a heavy tax; it’s a pure-bred dog world in Hungary. If you wish to draw larger, metaphoric conclusions about racism, have it. They’re there for the taking. Eventually, Dad forces Hagen out of his car, abandoning the poor animal to life on the streets. It’s instructive to note that Dad’s job involves inspecting slaughterhouses, a touch that brings even more emphasis to the uneasy relationship between animals and humans. Hagen isn’t a cute or cuddly dog, but he’s loyal to Lily, and she loves him. Fair to guess that the dog has become the main object of Lily’s affections at a time when she badly needs to be loved and her parents aren’t up to the job. Dad’s heavy-handed attempts to control of his daughter turn Lily into a surly teen-ager. Lily starts spending time with an older boy from the school orchestra in which she plays trumpet. Remember that trumpet, Mundruczo will make moving use of it before the movie’s done. The film follows Lily’s progress in searching for her dog and immerses us in Hagen’s adventures, which — dog-centered or no — are thoroughly Dickensian. A thug turns Hagen into a fighting dog. He’s brutalized and becomes brutal in scenes that are difficult to watch, even if you’re not a dog lover. We all know that animals have been trained to do lots of different things on film. But to make his film, Mundruczo had to train large packs of dogs to act in unison. The sight of what looks like hundreds of wild dogs racing through the streets of Budapest isn’t something you’ll soon forget. No digital dogs here. Two dogs (Bodie and Luke) split the chore of playing Hagen; they acquit their species well. It’s not easy to believe that dogs would be able to dole out so much specific retribution, and by the end, Mundruczo has you wondering whether he’ll be able to bring this war between humans and dogs to a satisfactory conclusion. 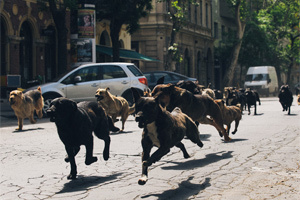 No fair telling more, but the final image of White God is unsettling and strange — quiet, but also tentative and fraught. I leave it to you to draw your own conclusions about what’s going to happen in the 10 or so minutes following Mundruczo’s amazing closing shot. You’ll need some of the information in the closing credits (no dogs were harmed, all dogs were adopted after shooting) to restore your sense of balance. But don’t expect Mundruczo to bail you out during the film: He’s not one to let an audience off the hook. So here’s a question to ponder: Dogs may be our best friends, but are we really theirs?